Elections have consequences. President Obama’s new budget represents a huge break, not just with the policies of the past eight years, but with policy trends over the past 30 years. If he can get anything like the plan he announced on Thursday through Congress, he will set America on a fundamentally new course. My friends on the left (hi, !) will say that it doesn’t go far enough, that its too timid, too centrist, too rooted in current politics. My acquaintances and friends on the right will say that its Obamageddon. And of course, the question is how will all of this get through Congress, and how will the final product actually look. Disclaimer: I received this copy of Drood for reading and reviewing thanks to the good graces of the Hachette Book Group. This is a rare opportunity to work with one of the most highly regarded and fastest growing media groups within Second Life. Prim Perfect consists of three distinct productions: Prim Perfect magazine (Second Life’s premier home and gardens magazine), The Primgraph (Second Life vintage and steampunk magazine), and Meta Makeover (the SLCN TV show for Second Life homes and gardens). We wish to hire an energetic, enthusiastic, and proactive individual who can successfully manage advertising and client relations for all three productions. streams; maintaining good relations with existing clients; managing client accounts; and handling client invoicing. You will work both independently and with the various production teams, so good communication skills are a must. The successful candidate will have attitude, aptitude, and appetite. A proven ability to meet deadlines is highly desirable. Proven writing skills and a willingness to contribute periodically to a group blog will be an advantage. Applicants should have at least six months experience in Second Life, which should include having held a Second Life employment position, preferably connected with sales or management or marketing. Applicants should also understand something of the design process and key issues affecting designers. Experience in RL print, online or broadcast advertising sales may be an advantage. Payment will be on a commission basis. Via many places, including John Scalzi’s blog. Phillip Jose Farmer passed away last night at the age of 91. I will fondly remember the Riverworld series, and even more so, the World of Tiers. I found the latter because Roger Zelazny cited them as a strong influence on the development of his Amber novels. They are fine novels in their own right. If you haven’t read Riverworld or the World of Tiers novels yet,you now have an excuse to go out and do so. This is still a test. If this weren’t a test, something insightful and brilliant would be written here, illustrating a deep and varied opportunity to educate my readers on the things that matter most to me. What do you want? This is a blog! I will keep the meme short. This is a list of the last 13 Oscar Winners. Did you see it? Did you see it in the theater? Did you see it before the Oscar win? Did you see it before it was even Nominated? A small film starring Ricky Gervais (The Office), Greg Kinnear, and Tea Leoni. Ricky Gervais plays a misanthropic dentist, Pincus, who despises the company of his fellow man. Kinnear plays a recently deceased man whose ghost is still hanging around; Tea Leoni is his widow. When Pincus briefly “dies” during a routine colonoscopy, he gains the ability to see ghosts like Kinnear. Ghosts have unfinished business and problems (We who have played World of Darkness call them “fetters”), and since Pincus can see the Ghosts, they, led by Kinnear, want him to solve their problems. Kinnear wants Pincus to break up his widow and his too-good-to-be-true social lawyer fiance. So the movie tracks back and forth between comedy and romance, not at whiplash speed but enough to have the joins show in the plot. It has the requisite happy ending, and a pretty standard story arc for a movie of this time complete with a false dawn and a false failure. (A pretty spectacular one, too). Within that template, though, the three leads do fine and the movie definitely improved my sour and depressed mood. 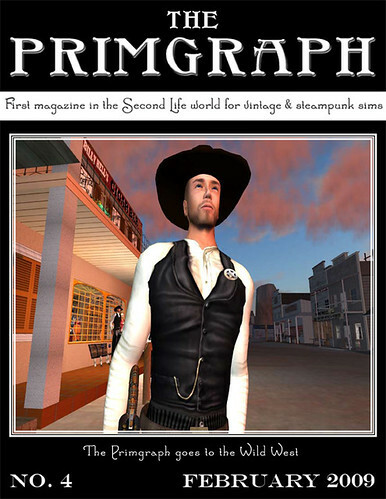 Its time for another issue of The Primgraph, the SL magazine devoted to Steampunk and Victorian sims. This month, the Primgraph does something a little different–and our focus this month is a trip to the Wild West. From the sims of Tombstone, to a review of the year 1883, to the secret passion that Saffia Widdershins has for the western novels of JT Edson, you’ll smell the desert wind and imagine the sagebrush in this issue. And that is hardly all! We have news and pictures from Babbage, our monthly serial The Mysteries of London, and much more. Like its sister publication Prim Perfect, every issue of the Primgraph is jam packed with all sorts of reading goodness. And, oh, yes, this month there is a modest article from yours truly, a trifle, really, about the roleplaying sim of Rivet Town where the two halves of a steampunk victorian society live cheek by jowl…and very uneasily. How do I get my copy of The Primgraph? You could buy a copy from xStreetSL to be delivered to you inworld. Best of all, you can join our Subscribe-o-Matic group. These are located at historical and steampunk sims across Second Life (for example, you’ll find ones at all the Caledon inforhubs). And if you can’t find one in your favourite sim, why not ask the owner to install one? But if you prefer to read the magazine online but not inworld, there are choices too. Firstly, there’s the wonderful Calaméo system, which allows you to moves smoothly through the pages, giving you the feeling of reading a real magazine. You’ll find Issue 4 here – and please do leave a comment! But, if you like to download your magazines to read as you commute to work, or in the bath, or wherever, you can also obtain a standard pdf for downloading and printing. The NY Post has responded to the overwhelming reaction to the cartoon I blogged about the other day. It’s short, and a little prickly in defending themselves, but do read it. Really, its not her politics, its her complete stupidity. I have made no secret of my dislike for my Congresswoman, Michele Bachmann. It’s not so much her politics (I live in a Republican district, I’m bound to get a Republican Congresscritter, ok? ), but that she is mendacious, stupid and possibly just crazy. I have said it before and I will say it again. I could do a better job, with my lack of experience and all, than my current Congresswoman. Of course, the odds of me getting elected in my district are probably on a par with the odds of Michele Bachmann converting to Islam.